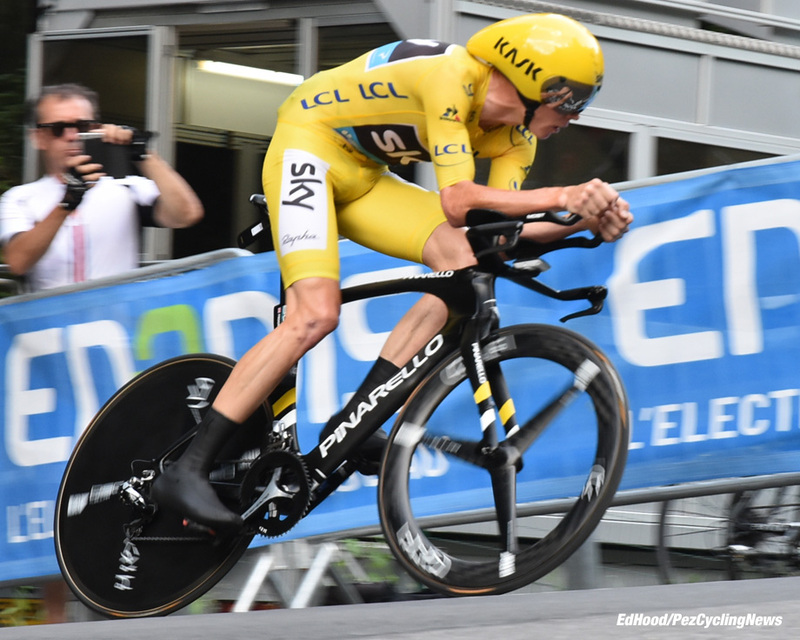 Sunday afternoon and up in Paris Greipel is reminding everyone just how experienced and fast he is. We’re in Geneva, about to fly home; Stage 21 doesn’t hold the same allure as it used to, it’s a long way from the Alpes to Paris and there’s little FanLove up there for Christopher despite the fact that he’s an excellent Grand Tour rider. He’s beaten the daftest risk takers on the descents, climbed easily with the best, out-tested the chronomen and even spoiled the sprinters’ party – the man is the best. BUT, he looks dreadful on a road bicycle, had little real opposition and it’s hard to imagine Jacques, Eddy or Miguel doing a bit of orienteering on a mountain stage. Time has flown for us - we arrived one week ago into Geneva on the day Jarlinson Pantano (IAM Cycling) won Stage 15 into Culoz. 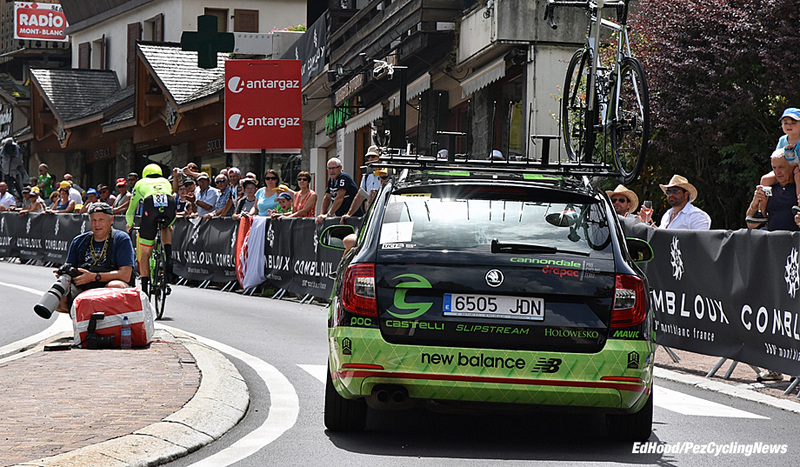 The Columbian had an excellent amateur career with podiums in the GP Tell and Avenir, his progress as a pro has been steady but this year he really announced his arrival as a mature rider with a Tour de Suisse stage win and fourth and GC. We ‘enjoyed’ our first adventure of the Tour with a nightmare wait on the hire car and a waste of time drive to the digs, which should have been near to the start of the Monday’s stage but were now a million miles from the finish of Stage 16 where we’d have to get our credentials, having missed the 8:00 pm cut off at the Culoz Permanence. 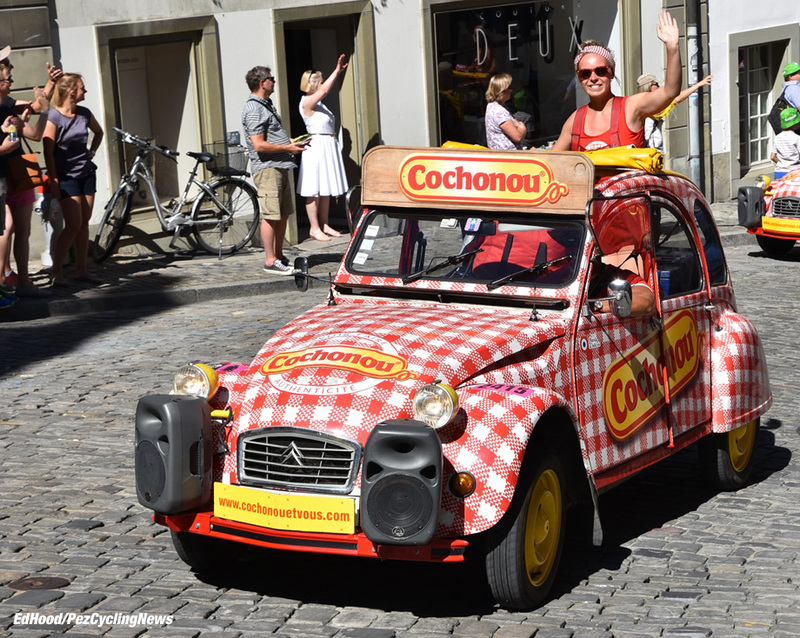 Monday – and we were in Bern for Stage 16, we uplifted our ‘creds’ with remarkably little fuss and even received a voucher for a free lunch. We wandered out the parcours for about three K, enjoyed an over-priced beer and took in the caravan. It’s bigger than ever and the junk rain is so intense that the freebees were bouncing off my head. Our ‘adventure’ of the evening was remembering that the Suisse have their own damn plug sockets. Early attempts to hi-jack the plug off the bedside light in the digs failed so a panic trip to the local Co-op store ensued – we were lucky and they weren’t even expensive. We missed dinner but the lovely ladies in the digs made us nice sandwiches. 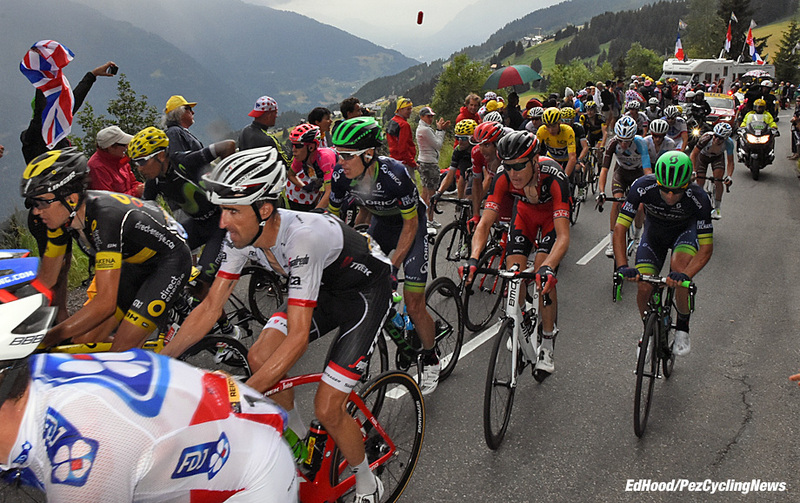 Tuesday was ‘rest day’ and not a l’Equipe to be had in Bern – damn! All three interviewees arrived bang on time – remarkable. 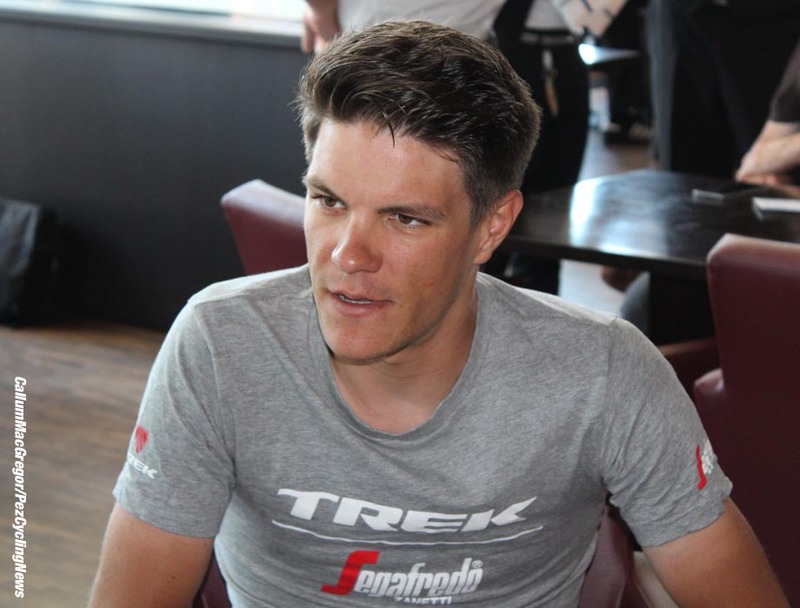 We were a wee bit worried that Jasper Stuyven might be a little, let’s say ‘over confident’ those Belgian laddies get told they’re brilliant from an early age and it goes to their head. Not a bit of it. He was polite, grounded, interesting, with a sense of humour – a pleasure to speak to. Next up across town was Dan McLay, the race’s sprint revelation. Dan was a very good amateur in Belgium but ‘stalled’ a little before he got back on track – this year he’s moved up a level with wins in the GP’s Denain and Somme. Dan’s not as self confident as Jasper; maybe still a little stunned by his own success – but another nice guy and good to interview subject. 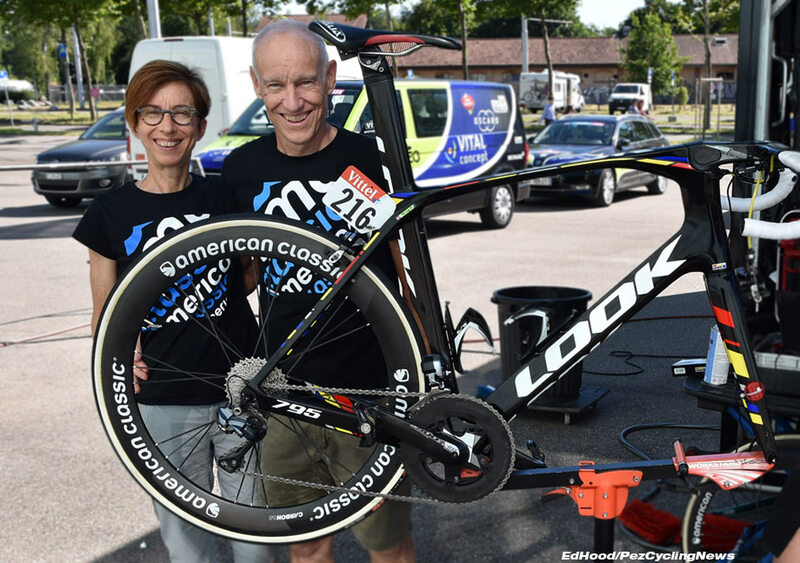 Our final interview was with Ellen and Bill from American Classic wheels – watch out for the next part of your education on hoops when we run the interview. 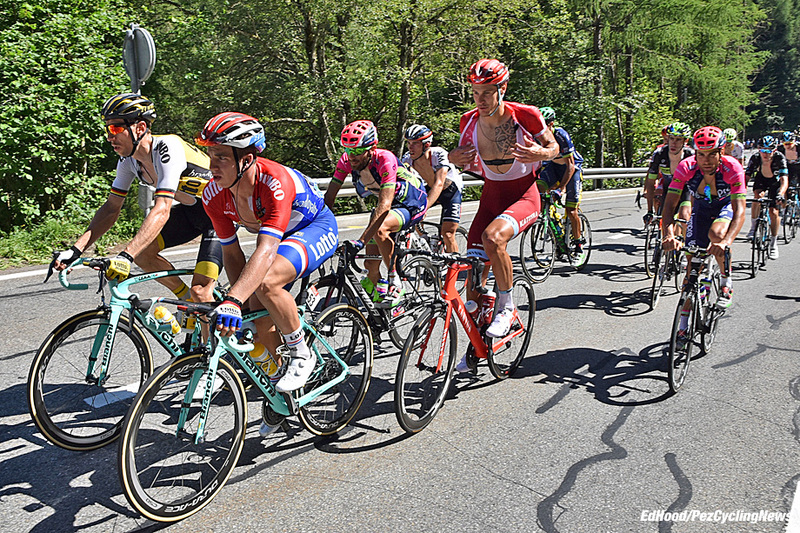 Wednesday and we were in the mountains to see that skinny Russian Zakarin ride past in the break before he cleared off to eventual Stage 17 victory. 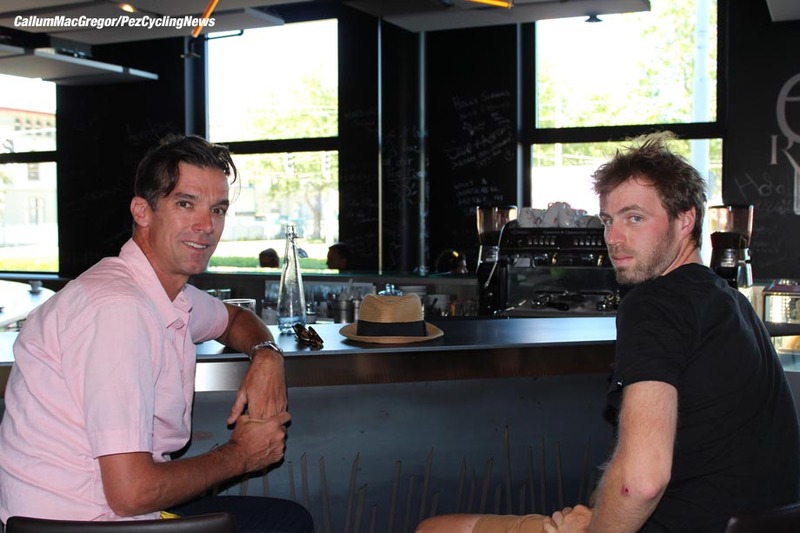 There was a lot of suffering going on behind with Shane Archbold chewed up from his crash – which would eventually end his Tour; and Dan McLay hurting bad. ‘How about we toss a coin for it?’ says Ed. ‘How about I take your credentials from you?’ came the reply. ‘Merci, ciao!’ and I was off like a ferret. But we’re never stuck for long and got ourselves back up the climb on the back roads. 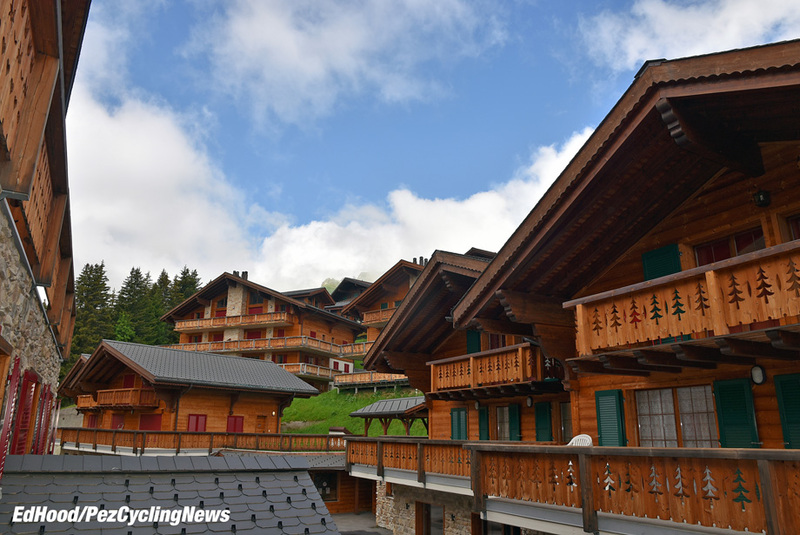 Then the fun started; the road to our digs was closed so we had a huge detour; the wi-fi in the digs was switched off and there were no staff to speak to – eventually we got connected in a restaurant where we took a direct Suisse Francs hit for a pot of fondue and two beers. But in best Pony Express tradition, the pictures got through. 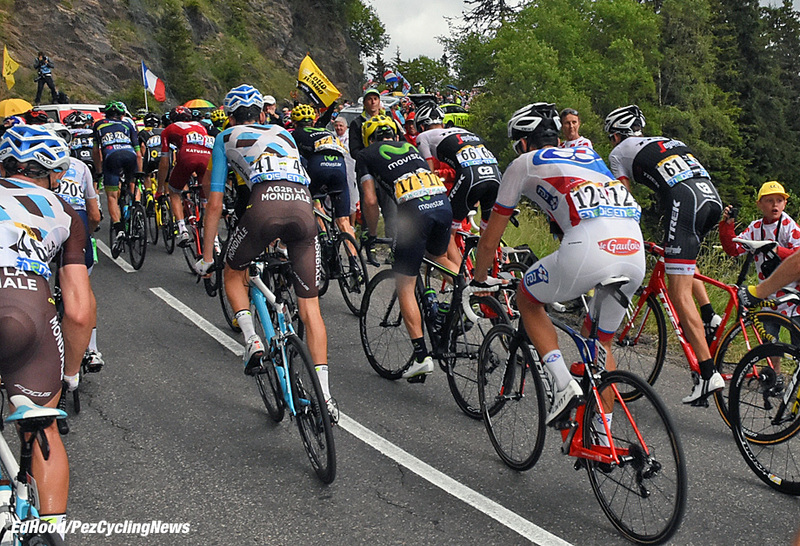 Friday, Stage 19 and we set up shop atop the second last col where eventual winner and pride of France, Bardet was still in the group behind K of M points hound, Majka. 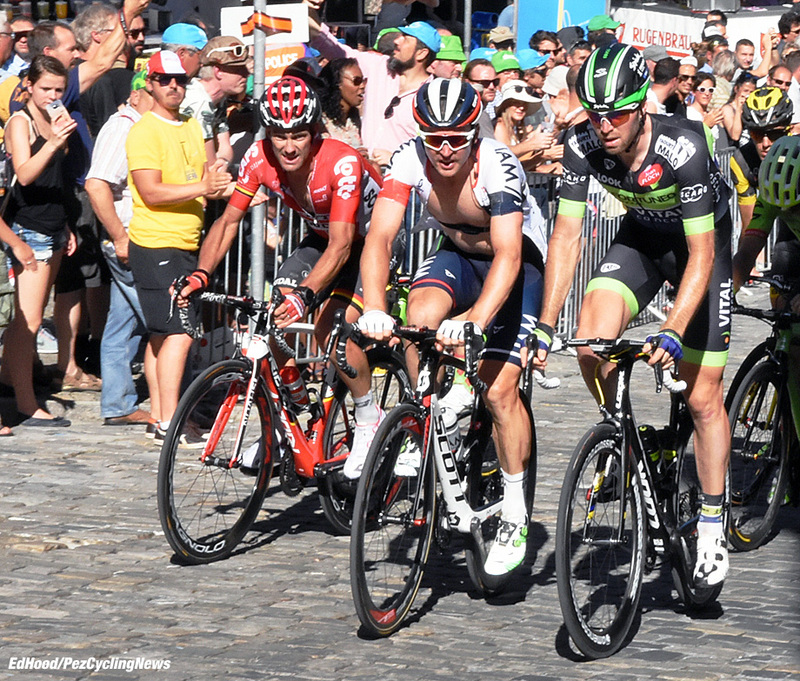 We were worried that Dan McLay might not make the cut, he was stone last with no domestiques to chaperone him – but the man has grinta and made the cut, not so far behind the gruppo. The pics flew from a pizzeria in Bourges Saint Maurice – the Dell still has a healthy coating of mozzarella – but only after we had to abandon our first temporary HQ in a bar due to a plague of flies – horrible. 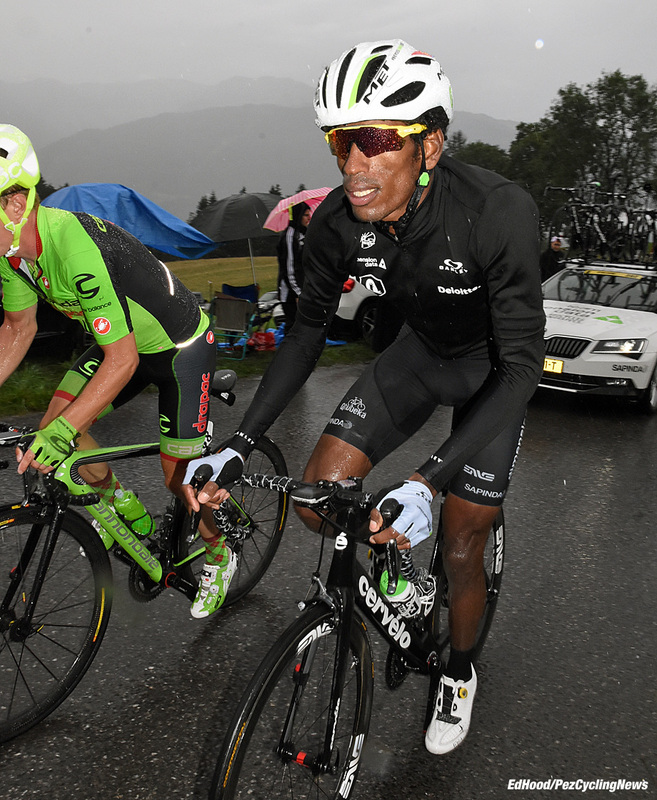 Saturday was Stage 20 and the day it was all meant to happen – but one look at The Bigs in that thunder storm told you they were all running on fumes and had settled for their GC position. 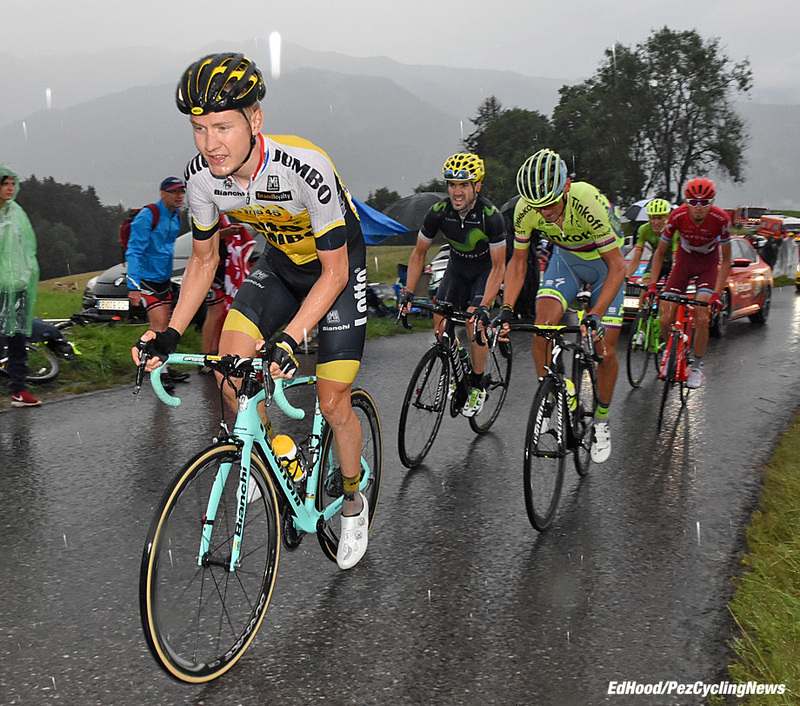 Izagirre was bravest/maddest of the baroudeurs, out rainy descending two men who usually get down hills in a hurry, Pantano and Nibali. Our joy at not having to go back to our ‘Shining’ digs in Les Arcs 1600 – where the plumbing was horrific and plug sockets pulled out of the wall – was tempered when we discovered my laptop was ‘locked’ into their wi-fi network and I had to do a ‘system reset’ which only completed at midnight. 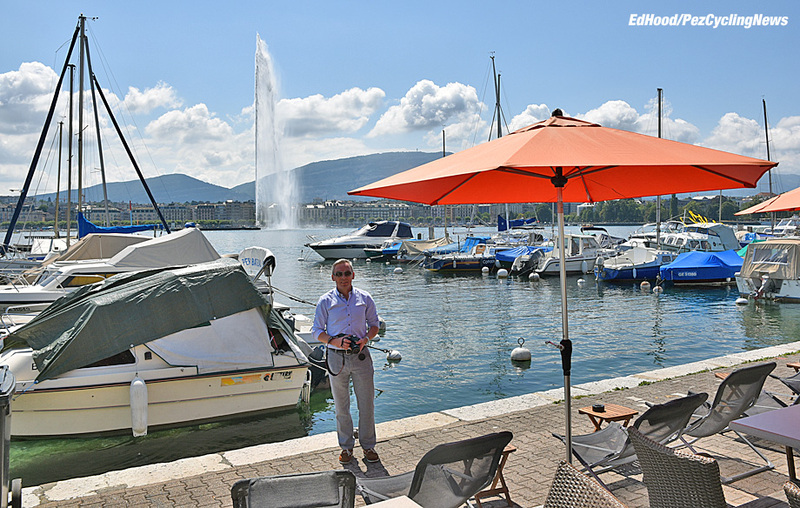 And that was us; no drive to Paris just waking up in the Alpes, a run past beautiful Lake Geneva and a kir looking at the fountain in the lake on Sunday. One couldn’t claim it was a great Tour from a GC point of view but it had its moments and as usual it was a wonderful experience. Our Euro Editor, Al Hamilton was patient with us above and beyond the call of duty as we rode our waves of hassles, Callum drove endless mountains and put up with me with ne’er a complaint (well, maybe the odd one when we were in a double bed and I was giving him Bruce Lee kicks in my sleep) and the PEZ Meister left us to do the job without interference. A great team for a man to be involved with and a wonderful PEZ-perience - as usual. Thank you guys – and thanks to all our loyal readers. Now, when does the Vuelta start?